Joining the Breakout and the Proof in the Easy-to-Throw Line is the Gavel. 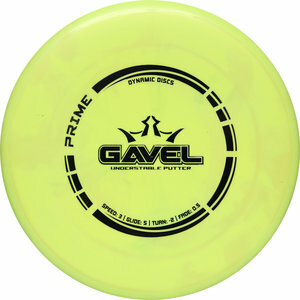 If you like the Judge, the 2013 Disc of the Year, you will like the Gavel. With the same shape and bead as the Judge but a smaller profile and overall width, it fits great in smaller hands and has a very easy release. Beginners, and many seasoned players, will love this light weight, smaller rimmed option. Feel confident on your putt and approach with this little sharpshooter and watch your scores drop. The Gavel is ready to bang chains on your behalf.